I didn’t have any of Heather’s ready-made templates to use with Bock 10 so I had to go back to the pattern. I tried to use Heather’s redrawn blocks but my printer wouldn’t print them the right size so I thought I would just use the original pattern. Then I looked at it and saw just how poorly drawn it was. The small segment is supposed to finish at the centre of the circle but as you can see you are supposed to cut the circular band on the fold and the fold line is way off the end of the segment block! I had to turn to EQ – not my favourite program. I had to redraw the block as a quadrant of a Mariner’s Compass and then print it onto freezer paper. 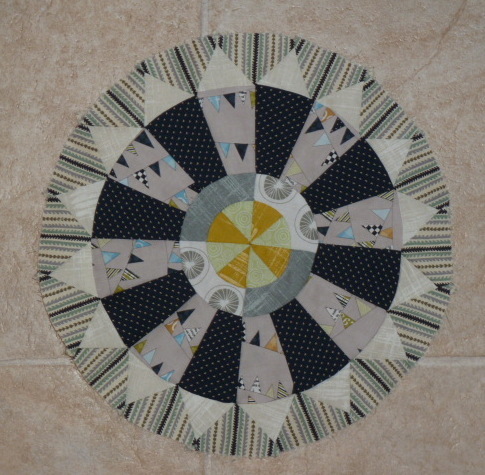 Because of this I decided to make a virtue of necessity and I made the circular band in quadrants instead of a plain circle. Anyway here is the resulting block. Once you got the pattern made, and the pieces cut out, was it easier than the others or more difficult? Pretty much the same as previously I used my friend Heather’s templates. Gorgeous. I love EQ for solving problems.